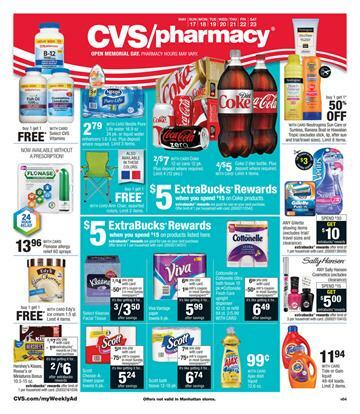 CVS Weekly Ad Apr 21 – 27, 2019 is currently available. You can view all the deals that are in the preview. CVS Ad Scan Apr 21 – 27, 2019. Learn how to save with CVS Extrabucks. 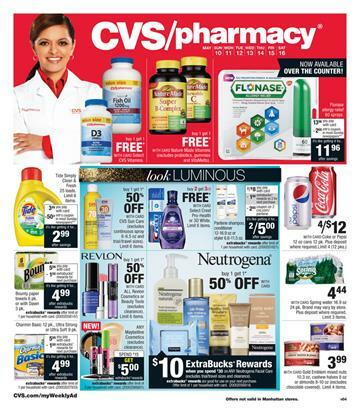 Prior to the release of the CVS Weekly Ad digitally, there are usually scans of the printed ones. You can see the CVS Ad preview scan by clicking on the links above. If you want to act quickly to see all the deals, you can always check out the weekly ad scans one week before they are online. Read the reviews about the product range of the current ad in the posts below. Scroll down to see all of them. CVS generally offers pharmacy products, however, they have healthy snacks range almost every week, seasonal price drops, special sales for Easter, Thanksgiving, Summer, Christmas, New Year etc. Discover the best weekly ad for your usual medicine supply. CVS Extrabucks and coupons will help you earn and profit out of shopping. If you like to shop at other pharmacy stores also see Walgreens Ads. 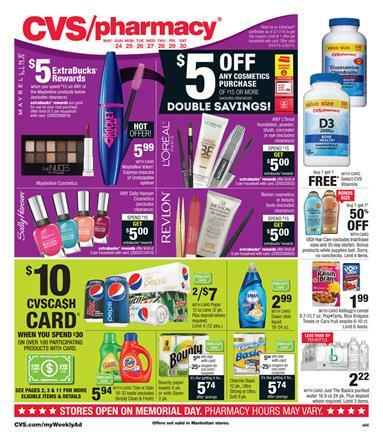 CVS Weekly Ad May 24 - May 30 2015 focuses on especially beauty products, health, personal care and summer products. By summer products I mean beach supplies. CVS pharmacy products on cover page will give you strength that you need for this summer. You can shop for these products on official page. The ad is full of extrabucks rewards of CVS. CVScash card $10 is yours when you spend over $30. In pg; 2,3 and 10 these products are available. Check out double savings of makeup and beauty products on cover page. L'Oreal, Revlon, Sally Hansen and Maybelline Volum products are featured. CVS vitamins are the BOGO deal ! OGX Hair care is half priced. A lot more products are profitable shopping with card on the cover page. Beach chairs $19.99 in red or blue. Lawn and garden decoration 33% off. Soft drink varieites of Coca Cola, cereals on pg; 3. Household items, cleaning products, Duracell batteries pg; 3. Beauty and personal care items, deo, shampoo etc. pg; 3. Your favourite chocolate, confectionery, snacks on pg; 4. Healthy food products, packed food and organic products on pg; 5. Stay prepared for this summer without spending big amounts. Come in stores of CVS to find best summer cosmetic, beauty and personal care products. Skin care is easier when you pay the fair price to them. Shampoo varieties, skin care products on pg; 7. Baby care products, Colgate toothpaste and toothbrush on pG; 8. CVS Weekly Ad Summer entertainment products 23 May 2015 offers are the list of one of the best. You can also see Target and Walmart summer products like grilling, beach supplies, slippers, swim wear etc. CVS Ad summer entertainment products are also similar to those what are available in the Target and Walmart Ads. But CVS has got extrabucks rewards in this time. This week you can also see chairs, umbrella, portable products, snacks and soft drinks which go with beach very well, and many more on pg; 5 of the CVS Ad. You can fulfill your needs by all means with using this CVS Weekly Ad which was published in 17 May and with efficient prices until tomorrow. Check out variety of products on this page. Some of the products are listed on this post. Powerxcel electronics from $5.99 with card. CVS Weekly Ad beauty products are available with the prices valid until tomorrow. Check out them from pg; 6-9. 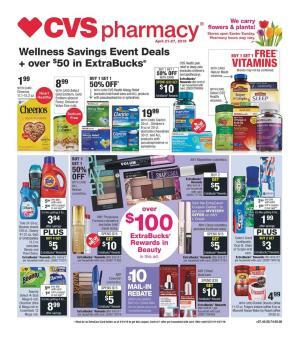 Find great savings and top brands of the beauty products of CVS with this ad. CVS Ad Preview 17 May 2015 which was published today offers food and pharmacy products. Cosmetics, beauty products, summer entertainment offers such as beach supplies, and extrabucks rewards are also featured. 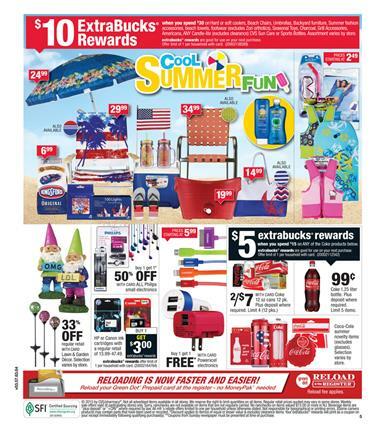 CVS Ad Preview 17 May 2015 cover page with extrabucks rewards are worth a look. On the cover page you can see pharmacy items as well. CVS Ad Preview 17 May 2015 first page contains household needs like paper towels, cleaning chemicals. CVS price for Coke is $5 for 4 of 2 L of Coca Cola. Canned soda varieties are on sale as well. In pg; 2-3 you can take a look at new prices of snacks. Visit this true great prices. Products of packed food varieties are also featured. View pg; 3 for more of the snacks and chocolates. This week a lot of deals of chips, chocolates, soft drink varieties are featured on CVS Weekly Ad. Check out extrabucks rewards on pg; 4 for the packed food varieties. There is price for nut pouches, tuna fish canned, eggs. Beach supplies like chairs, umbrella, towels, slippers, some electronic accessories to recharge your phone or something. CVS AD beauty and health products are started to be exhibited on pg; 6. There are more on pg; 7,8,9. Mascara, lipsticks, foundation, anti-aging cream and the best brands from CVS Stores are featured on this section. MUA Makeup academy 25% off. Chocolates, confectionery and snacks are featured with the best prices. CVS dropped the prices to the very nice values. This is my favourite in each CVS Weekly Ad. You can browse new healthy and easy food on pg; 3. A brief list of the products from three categories can be read on this post but to see whole product range of CVS please take a look at the newest weekly ad. CVS ice cream, cool summer food products and brilliant soda varieties. 7up soda, candy offer and many more in May 2015 will be the best price range in all CVS Stores. 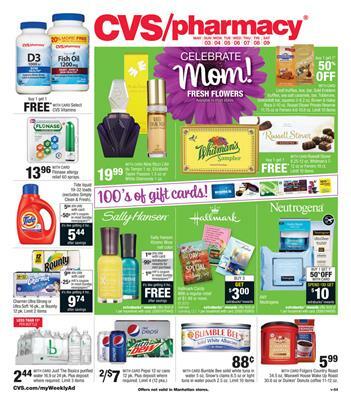 CVS Weekly Ad Mothers Day Gifts cover a good range consisting of beauty and health products, personal care items, some cosmetics. On the cover page we can discover new sales like fragrances, gift cards, Ferrero Rocher chocolates. Prices are excellent and deserve at least a good look on this section. 100's of gift cards are available in stores of CVS this week. On cover page a mixture of products are exhibited. They contain some of the beverages and soft drinks like Coca Cola, Bumble Bee solid white tuna in water and more like these. CVS offers chocolates, gifts, frames and many more different products on pg; 3. Take a look at the confectionery and snacks on pg; 2 as well. Mars chocolates, beach chairs, sun care creams and so on pg; 2. Lindt Truffles, box, bar Gold Emblem truffles ON PG; 3. Fragrances and special scents on pg; 3. Photo cards and frames on pg; 3. On latest CVS Weekly Ad you can see a lot more. Snacks, beverage, soft drinks, soda, and FILL YOUR BAG on pg; 4 and chemical household needs on pg; 5. Cosmetics, beauty products and skin care items are started to be present on pg; 6.